Baby, it’s cold outside! What a brutal winter it has been. Just about everywhere in the country, temperatures dipped below freezing and everything outside was frosty. When it is so cold outside, it is sometimes hard to warm up inside. A cup of hot cocoa, a steamy bowl of soup, or a yummy latte might temporarily warm you, but not without adding a few calories to your waistline. Solution: A hot, steamy shower or soothing, relaxing bath experience can be pleasant and warming. But at some point, it is time to step out of the shower or bath. Although that chilly transition can be invigorating, it does nothing to continue the mood of warmth and comfort. Solution: Step out onto a preheated floor or rug warmer. 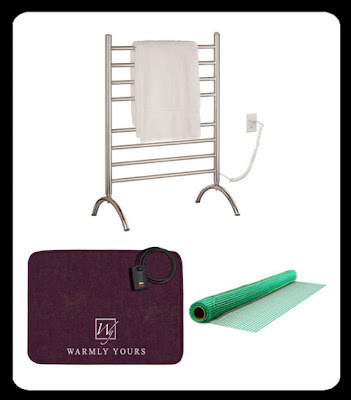 WarmlyYours offers two sizes of rug warmers that fit perfectly under area throw rugs. The smaller size warms up your favorite rug that is 4-by-6 feet or 5-by-7 feet while the medium sized rug warmer suits a rug size of 6-by-8 feet up to 8-by-10 feet. The dual temperature setting for the rug warmers controls the amount of the radiant heat. The durable rug warmers can be placed under the area rugs and remain there for the entire winter/chilly season. Designed to withstand normal use and foot traffic, their warmers add a touch of kindness to your tootsies in any room in your house. Keep the rug warmer a safe distance from any water, then simply plug it in to add that soothing warmth to your feet. Looking for that warm sensation on your feet to permanently last? There is also the option of installing a heated floor mat directly under tile or flooring in any room. Completely safe to walk on, this foot heated mat is rolled out and the flooring or tile is placed over it. Your feet never directly come in contact with the heating elements and it preheats the floor from the bottom up. No more cold tiles or flooring to step on any time of the year. You will feel the coziness while walking in the freedom of bare feet. The kids will love it! That takes care of the feet, but getting out of the shower or bath also exposes your tender self to the nippiness of the bathroom air. Even if the bathroom is steamy, there can still be a chill in the air. Solution: Wrap yourself up in a luxurious, over-sized bath towel that's fuzzy and warm after being heated by a convenient towel warmer. Towel warmers aren't just for the rich and famous—everyone can afford a big warm towel hug after stepping out of the shower or bath. It is like a cuddly plush embrace every time you get out of the tub. You can wrap yourself up in a blanket of warmth without being plugged in. Wrap your children up with a warm blanket or towel when they get out of the bath or when they are feeling a little under the weather. It just adds a little extra touch of love when you give them a hug.